The Syringe Protection/Collection Kit consists of an 8" long by 1.125" diameter clear plastic tube with a red anti-roll soft plastic top. 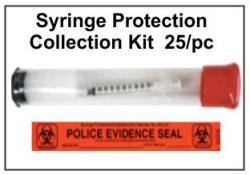 It is designed to protect police and crime lab personnel from deadly blood borne diseases when collecting and analyzing syringes found at a crime scene. The tube contains a closed-cell polyethylene insert to encapsulate liquids and secure syringe needles. A 7.5" tamper-evident evidence seal with biohazard symbols warn all personnel of potential health hazards.